Urbanista Seattle Wireless headphones review | What Hi-Fi? Urbanista is a name deliberately designed to appeal to millennials. You can imagine the marketing meeting now: an expensive digital whiteboard with offshoots about skinny lattes and Beats headphones. It’s not the sort of name that might fill audio nerds with confidence, but the Urbanista Seattles are among the best-sounding wireless headphones under £100. They have the bass boost to be expected of a street headphone, but also have an alluring smoothness and width worth listening to. The Urbanista Seattles look like headphones you’ll see on the streets of every major city. 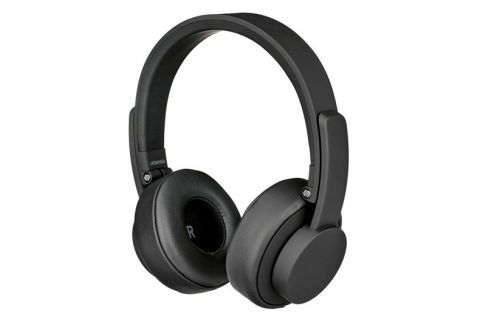 They’re relatively plain, and don’t stick out too much, but are clearly style headphones. The Seattles come in pink, blue, black or white, and the entire frame is finished in soft-touch plastic. It’s silky smooth, and has an ultra-matt look that doesn’t draw too much attention. Urbanista’s street look is typical of how ultra-populist portable headphones have developed over the years. Aggressive lines have been toned down, a minimalist approach not only making these headphones gender-neutral but also far more likely to appeal to slightly older buyers. Street headphones these days are really for 16 to 45-year-olds (at least), not 16 to 25-year-olds. The Seattles have synthetic leather-topped memory foam pads, providing a comfy fit as long as you don’t mind putting up with some headband pressure. There’s enough tension to provide stability for runners, partly thanks to a high-friction rubberised headband, and they don’t have a super-loose or breezy feel. You can wear them, even with glasses, without major discomfort. In their class of run-ready on-ear headphones they’re comfy, though we’d advise those with smaller heads to try before committing. They are wireless headphones, but there’s almost no sign of this when viewed from a distance . There are no playback buttons on the cups, and there’s a 3.5mm socket on the left cup should the battery run out. They last for up to 12 hours from a single charge, mind you, which is fair - although obviously nothing like the Beats Solo3 Wireless, which last for up to 40 hours. To switch them on, you toggle a little switch under the right cup. Continuing the whole minimalist vibe, there’s just a beep to let you know the Seattles have paired successfully. The right cup is touch-sensitive, letting you control playback and volume with the usual gestures. That’s up/down to alter volume, left/right swipes to change tracks and taps to play and pause. It feels fiddly if you’re trying to issue more than one command, but they do work. Wireless performance is good too. There are no bonus features, no NFC active noise cancellation or aptX, but transmission is largely blip-free. They use Bluetooth 4.0, and there’s a mic built into the right cup for hands-free calls. Attractive design and good Bluetooth performance considered, sound quality is still the sweetest part of the Urbanista Seattles. For a pair sold in clothes shops, they are almost alarmingly good - as long as you are game for the slightly heavy-footed bass common to almost all ultra-mainstream headphones. The bass is not a clouding influence, but is tuned for impact rather than neutrality. It comes across as a lower-end version of what’s offered in the Sennheiser Momentum 2.0, a fun thump without swamping the sound. To be clear, it’s not as accomplished as the Sennheiser equivalent, and can sound a little one-note. It seems designed to give kick/bass drum beats impact and sub-bass frequencies weight, and as such avoids bleeding into the mids. It’s the rest of the sound that sets the Seattles apart from the crowd, with unusually detailed but smooth mids and sweet treble. Too often more affordable headphones have either hollow-sounding mids or definition with a raw edge. Not so here. With the localised bass boost reined in by a couple of decibels, the Seattles would sound rather well-balanced and grown-up. Stereo imaging is good too, particularly when you consider these are really £50-60 headphones with an expensive wireless party-piece. Songs with a strong kick-drum can sound somewhat hemmed in at the bottom end if you start listening analytically but, for casual listening in particular, the Seattles are immensely charming. Treble is easygoing and non-sibilant without being obviously attenuated, and the mids and treble are well integrated. Vocals sound more natural and more convincing than we expect from £100 wireless headphones. It all comes down to whether you object to the narrow-band bass emphasis. If you don't, you’ll like the Seattles a lot. The Urbanista Seattle Wireless are one of the best-sounding pairs of style headphones you’ll find for this kind of money. Their tech is fairly basic by wireless headphone standards, but the sound quality (when judged by their peers) is great.